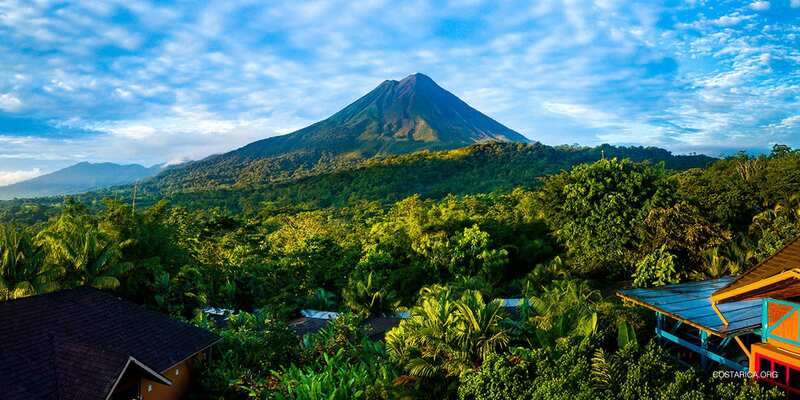 Fun fact: Costa Rica fits into the United States 74 times. Whether you’re planning a Costa Rica vacation, thinking about moving to Costa Rica or working on a research project for school, you might find yourself asking “how big is Costa Rica?” Costa Rica is tiny country in Central America between Nicaragua and Panama. The land area of Costa Rica measures at 51,100 square kilometers, or 19,700 square miles. To put that into context, this makes it a little bit smaller than the U.S. state, West Virginia. It is also similar in size to the European country of Denmark – although Costa Rica is slightly bigger. Using this measurement, Costa Rica is the 129th largest country in the world. When you’re asking “how big is Costa Rica”, you should consider Costa Rica’s sea territory. If you include Costa Rica’s sea territory, the country expands a bit. Costa Rica’s claims over the water extend out twelve nautical miles into both the Atlantic and Pacific oceans. This is about 13.8 land miles or 22.2 kilometers. All in all, this amounts to an area of four hundred and forty square kilometers. It is a significant addition to Costa Rica’s mass. With the sea territory taken off, Costa Rica is only 50,660 square kilometers. Another thing to consider when trying to determine how big Costa Rica is, is its disputed territory. The country has a border dispute with its northern neighbor, Nicaragua. This goes back to 1858 and revolves around the River San Juan. Although this is a small area, if you want to know Costa Rica’s actual size, it should be taken into account. In 2010 the dispute flared up. Both countries sent troops to a small island at the mouth of the river. The crisis was averted, but the issue was not resolved. However, in 2015, the International Court of Justice declared the area Costa Rican territory, adding 151.6 square kilometers (or 58.5 square miles) to the country’s size. Although the matter seems settled, Nicaragua still claims the territory and does not think Costa Rica should consider it as their own. Another aspect of Costa Rica’s size to consider are the extensive coastlines on both the Pacific and Caribbean sides. Costa Rica has both the Atlantic to the east and Pacific Coast to the west. The pacific side is almost 4 times bigger than the Atlantic (Caribbean) coast. It stretches all the way from Guanacaste to The Osa Peninsula, making it 1,016 kilometers or (631 mi) long. The Caribbean is only 212 kilometers or (132 mi) long. That totals 1290 kilometers in coastline. The tallest point of Costa Rica is Cerro Chirripó, standing 3,820 meters or (12,533 ft) high. You can hike to the top. You must make reservations and plan on it being a 3-day hike. On a clear day, you can even see both coastlines. People come from all over the world for the amazing view. The lowest point in Costa Rica is 790 feet below sea level in the Barra Honda National Park. Also notable is The Irazu Volcano which stands at 11,259 ft, the tallest volcano in Costa Rica. In terms of biodiversity, Costa Rica is one of the biggest countries in the world. Almost half of Costa Rica is made of forest land, most of which is either considered a protected area and/or national park. In fact, Corcovado National Park (Osa Peninsula, Southern Puntarenas) has 5% of the world’s biodiversity within the park. Not only does the extensive biodiversity provide an abundance of natural beauty, it creates a home for thousands of plant species and animals. Tourists flock to Costa Rica in hopes of seeing any of the hundreds of species of birds like Scarlet Macaws or the Resplendent Quetzal, monkeys, sloths or even wild cats. The landmarks are also incredible. You’ll find multiple types of rainforests like the Monteverde Cloud Forest or Tropical wet forests along the Caribbean coast, beautiful beaches like Santa Teresa in the Nicoya Peninsula, active volcanoes like the Arenal Volcano and waterfalls like Los Chorros in Grecia. Home » Costa Rica Facts » How Big Is Costa Rica?